For today, filming will start from the morning. I think I'm still sleeping, in my head. 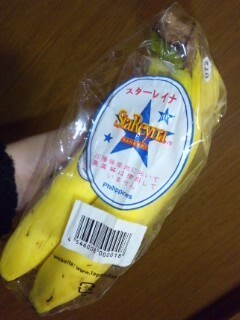 It was totally coincidental, my mum stumbled upon it and bought some home. 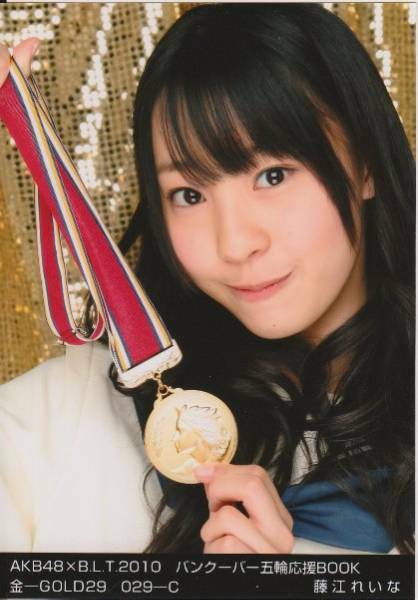 Reina too, for the sake of being a Star Reina, I'll work hard every second for it! Reina too, wants to be a Star Reina! It sounds magnificent, so today too, let's move forward positively! Hopefully your year will be full of happy things! Applications will start now, for 25th February. The instructions to apply are posted on the message board, so please apply after you've read through it! The whole of today too, let's work hard! We'll meet again later tonight, ok? Today was really fun, too. We took a lot of photos like that. On a completely unrelated note.. Cute and crunchy, I was totally taken in. 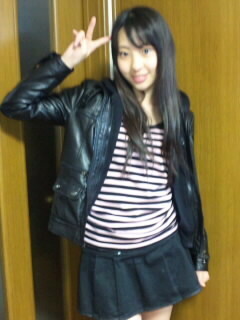 Maybe I should pester Tomochin..
Don't rush through, and till the last second, please work hard!!! For the next two days, I'll lend you my power, so please work hard for the day after tomorrow as well! Let's meet again tomorrow, ok? Reina too, I'll work hard from tomorrow morning! That would make an awesome poster. 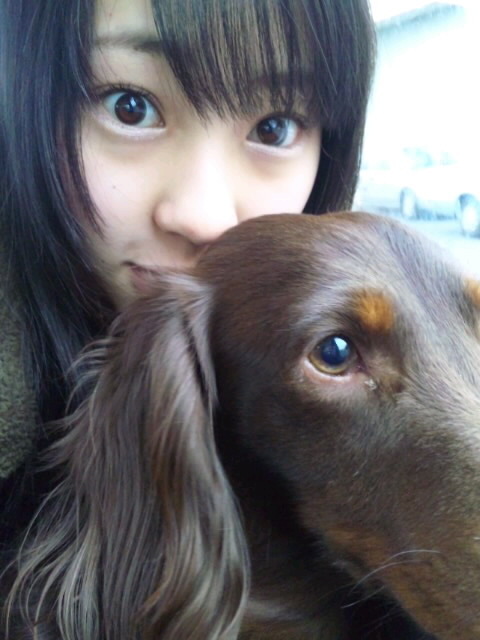 Reina has been going up in my rankings lately, from reading her blogs. Also, I want some Tomocookies. where from that pic <3~~~ ? It seems that MaiMai's influence on Reina is starting to show !! hydeo, it's from her first DVD Tokunatsu Girl, which can be downloaded in iso format here. I can't remember if there's an avi rip floating around somewhere. 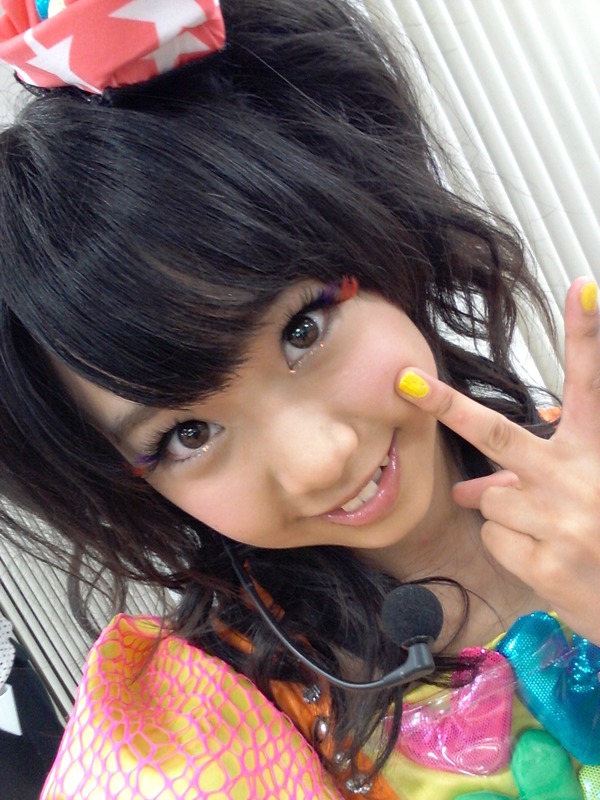 The person in the picture is Tanamin. I got back at 5am. It's still dark out. Didn't have much time to sleep, so I'm still quite sleepy. "What's there to do at a time like this?!" 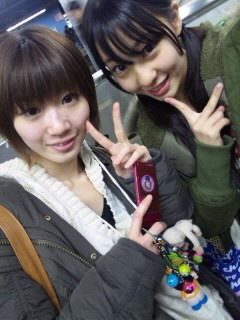 Today I'm going with Chika (Chikano Rina) to a location shoot for a TV program. I'm a little nervous (kind of like it's my first time), but being together with Chika is reassuring. I think I'll have fun. Even the rain that I've been worrying about, seems like it's going to be alright here. It's nice if it stays like this. Once that's done it's time for lessons. I have no time to lose to sleepiness! Lol. I'll work hard. Happy birthday! May you have a year of many smiles! Applications for birthday and exam-taking (for 10th March) start now (ending at 8pm). More details can be found on the Message Board, so do check on how to apply. That said, I'll work hard for the day! Yesterday's lesson ended very late, and I couldn't update when I got back. I'm sorry! Yesterday, me and Chika appeared on a Chiba TV program, Kinyoubi Kawaraban. We went on location at Mother Farm. We did a report on it! It was our first time as reporters, but I think we managed to report favourably on Mother Farm! The broadcast will be spread over 2 weeks, from 19th to 26th. It was really really cold, and we did our very best, so I really hope you guys will watch it..
People in Chiba, and anywhere else that it's shown, please do watch the broadcast. And now I'll be heading off for lessons! See you. I have tests today and tomorrow. If I don't pass I won't be promoted, so I'll do my best! 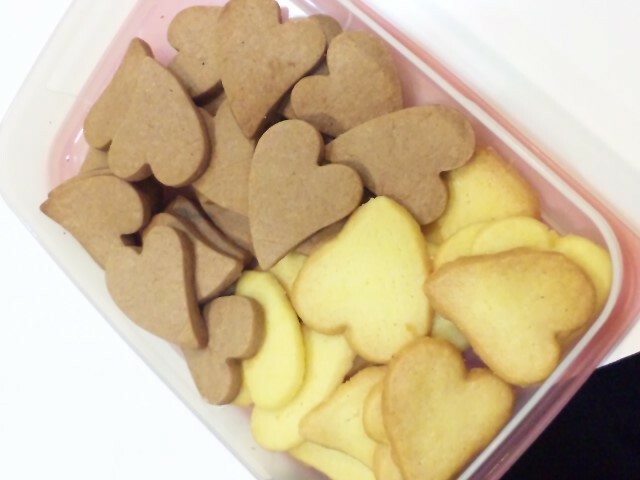 But whenever I think of the tests I get sleepy..
Oh yes, yesterday was White Day, and I got this stuff from my dad. 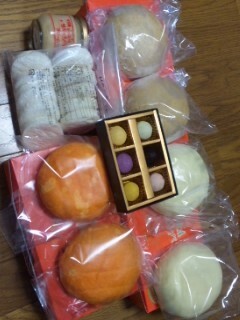 He got me some caramel Hanabatakebokujo melon-pan, and Imomochi! Yay. Reina loves Imomochi, but this caramel flavour is new to me. I wanna try it! Isn't the t-shirt just cute?! Today I'll work hard with a smile and energy! I loooove that outfit. But man, girl should learn how to take better quality pics! She's still better than the other girls though, in that she doesn't take too many photos of food, and only food. Now in the multimedia section. Page created in 0.397 seconds with 18 queries.